Danger, deadly blackouts and strange freezes. This was the first week of Defiance thanks to server issues that go hand in hand with both MMO launches and trying to fit over 10,000 possible players on to a console game. But I persevered and was thus rewarded with a rich game world, interesting storyline and some great gameplay once everything sorted it self out. While I’ve nowhere near seen everything the game has to offer, this is my review of my experience so far. Defiance is a rare beast, then. An MMO-shooter hybrid on both console and PC and one that isn’t afraid to wear the MMO side of the experience proudly. Play your own game, by all means, but you’ll be sucked up into a major multiplayer event before long and you’ll enjoy it, too. It has hints of genre shooters like Halo and certainly more than a whiff of Borderlands to it, but Defiance has carved its own path through being a TV show/Game hybrid, both sharing the same world and characters. The game is a collaboration between Trion Worlds and the Syfy Channel, allowing the game to sit in a universe alongside a TV series running at the same time which, in turn, creates well rounded characters and some interesting cross-media connections. Though it shares many things with Borderlands and its sequel, including the roaming mission style gameplay, it feels significantly different from 2Ks franchise. The world feels more realistic, for a start, and encourages more open roaming. Your character is one of the Ark Hunters, a team sent back to the ravaged planet Earth to find tech from the wreckage of alien ships, which people label as Arktech, and one piece of tech in particular. Unfortunately, the military ship you were on with your leader, Karl Von Bach of Von Bach Industries (who doesn’t have the easiest relationship with the captain or the marines) is fired upon and knocked out of the sky. As you awake from your escape pod you realise that you must find Von Bach, the only person who knows your mission and survive the hostile inhabitants who seem to have a history and strong connection to Earth’s military. Missions open in typical fashion as you’re gently encouraged to follow a main mission structure or choose to go off and do side missions whenever you want. These range from protecting a bunch of troops to tagging certain items or fighting off the mutant inhabitants who have taken over an area. But, missions aside, sometimes it’s just as fun to go off and find a big bunch of mutants to mess with and see just how long you can survive. 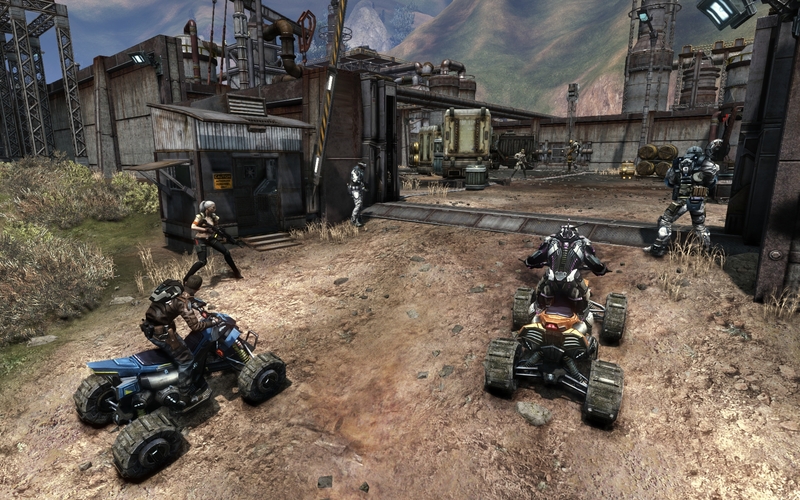 Gameplay is fast and furious once you enter areas with a lot of enemies. There’s a big difference in AI between enemy types, from those that rush you and prefer melee combat to enemies that will stay back and shoot from a distance. The range of enemies is certainly matched by their design, from scary looking monstrosities to more human looking mutants. A single jaunt across the map will often lead to finding a huge number of these inhabitants. There are also big Ark Fall events, which focus on one off challenges that present themselves throughout the life of the game and encourage team play. They appear with a big red symbol on your map and usually a warning. Get to the place on time from where-ever you are and you can join in with many other players to defeat a horde of bugs or an enemy army. Rewards come in the shape of more weapons, armour and experience which will make the rest of the game that bit easier, but just as important is the sense of teamwork from these events. There are also timed races and survival events which you can replay over and over again. These all have their own dedicated leaderboards, so they feel a little like arcade games at times. They work nicely to mix up the gameplay in between larger missions and are dotted all over the huge map. Graphically, the game holds together well and ers on the side of a darker palette to make it look more war-trodden. The beta was famous for its glitches, but the finished game has settled down a fair bit. It’s still not perfect, but then it’s holding together a huge game world and thousands of players at once, so I can forgive it for being a little rough around the edges at times. Upgrading is another strong point for the game, with weapons and powers having various ways of upgrading, including add-ons and armour. Typical MMO style upgrades for EGO powers are earned by doing various tasks throughout the game and you’ll constantly come across crates and weapons trucks to spend your hard earned cash on. Loadouts can be customised with add-ons and even broken down for research. Likewise, you get the option to choose a combat style that suits you, depending on character and loadout, from sniping to using EGO powers. There is a good feeling of freedom in these choices and I never felt that I was forced down one route. I’ve only just touched the surface of Defiance with 7-8 hours of play, but it’s clear that this is a huge game that hasn’t yet fully realised its potential. 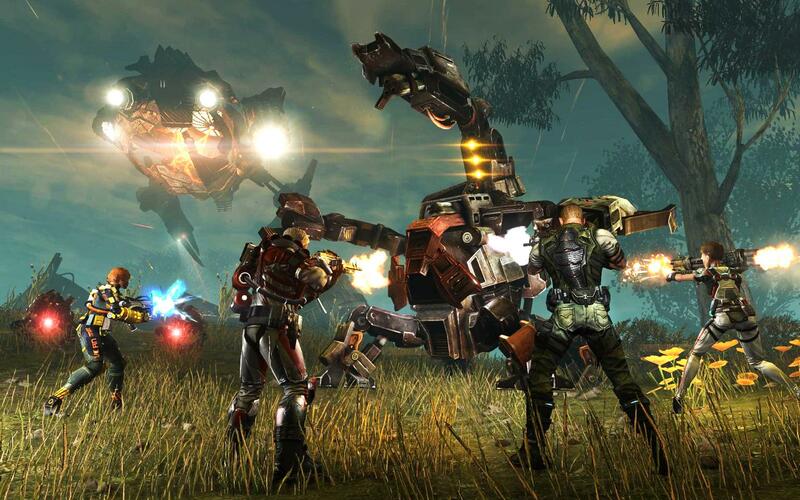 It’s still early days but, even so, Defiance manages to entertain and excite with something new for console and PC owners alike.